In 1998, the Finish Line Youth Foundation was created as the philanthropic arm of Finish Line. In 2018, we proudly celebrate our 20th anniversary of supporting life’s biggest possibilities. 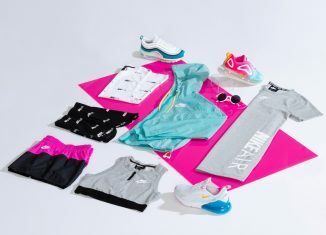 Throughout March, Finish Line stores will host the spring campaign to collect donations to continue giving back. Stop by your local store or donate online. Over the past 20 years, the Foundation impacted 1.6 million youth, donated $19 million nationwide and partnered with 1,030 nonprofit organizations. Our history represents our dedication to impact communities where our customers and employees live, work and play for years to come. Read below for several stories from employees about their favorite moments throughout the years. Be on the lookout for more #FLYF20Years stories and follow us on Facebook, Twitter and Instagram. It’s the season of giving back. 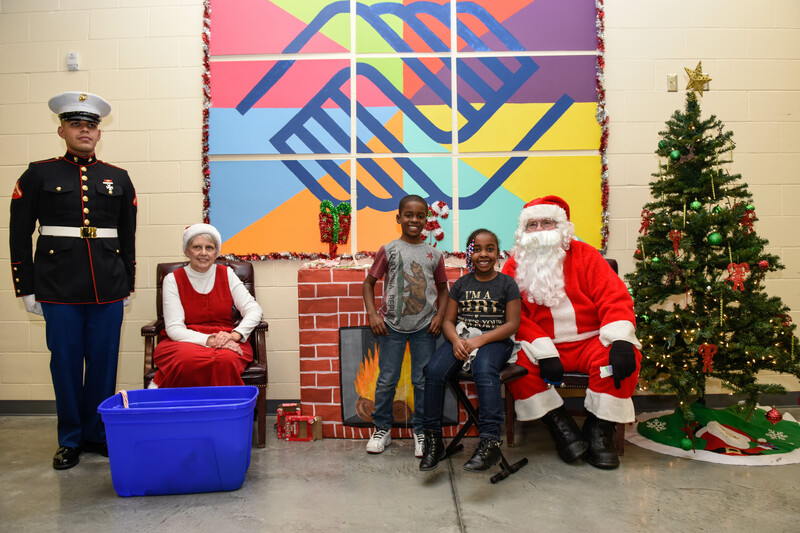 The Finish Line Youth Foundation partnered with the Finish Line Boys & Girls Club a couple weeks ago to host their first Holiday Bash to spread joy for the Club kids and families on the far eastside of Indianapolis. 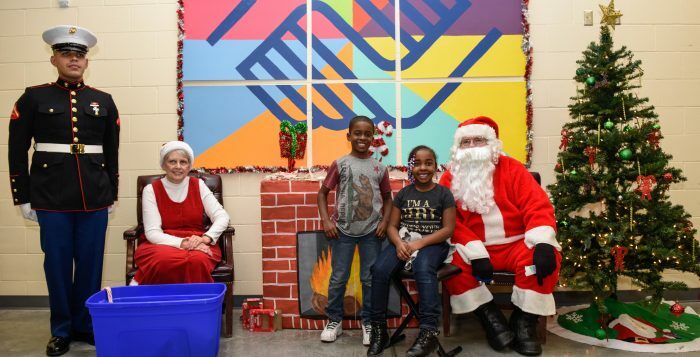 At the Holiday Bash, the families enjoyed dinner, games, face painting, cookie decorating and more throughout the Club and everyone received a gift. 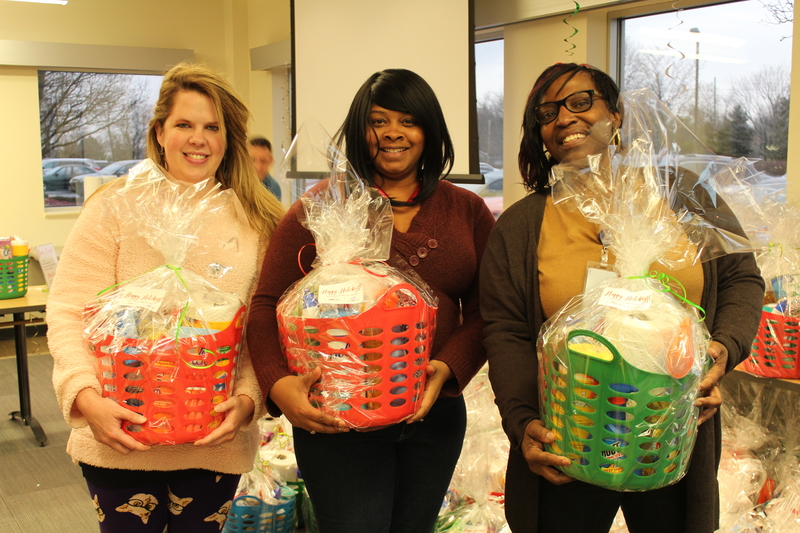 In the weeks leading up to the Bash, employees donated essential household items including laundry detergent, hand soap, toothpaste and much more to create family baskets for the parents and guardians to take home when they picked up their Club kid. A few days before, the Youth Foundation turned the Hoosier Dome conference room into Santa’s Workshop where employees helped wrap presents. 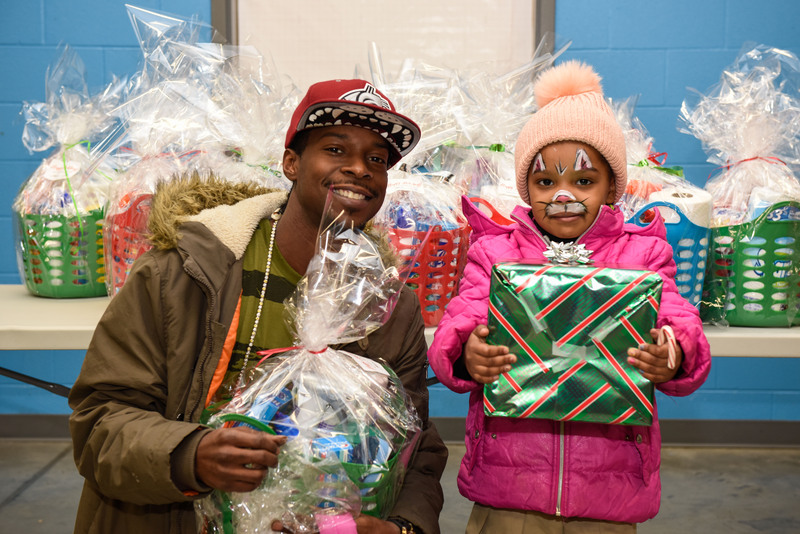 Over two days, employees wrapped 200 gifts as well as 100 family baskets. Finally, the evening of the Holiday Bash arrived! 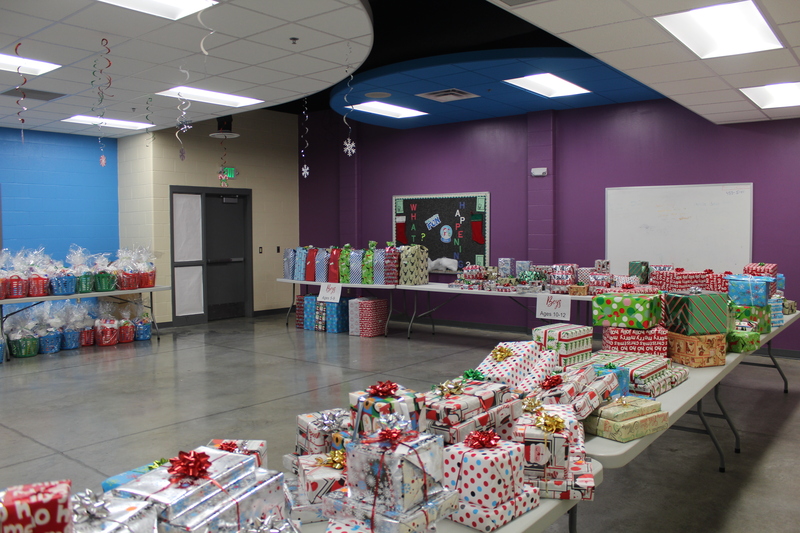 We stocked the cafeteria with all the presents and family baskets ready to surprise the families. 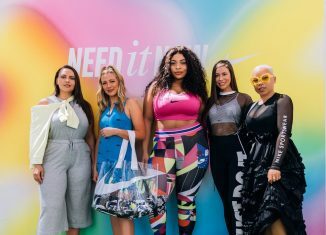 After revealing the gifts for the kids and families, we had one more surprise for the teenagers – Nike gym bags filled with all the essentials including a Finish Line gift card. 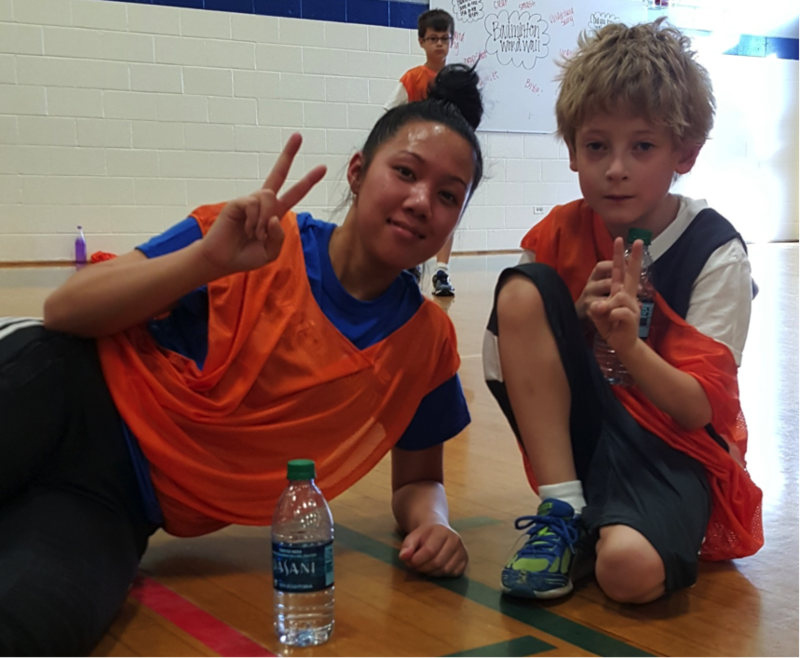 Daina is a lifelong Special Olympics athlete from Wisconsin. 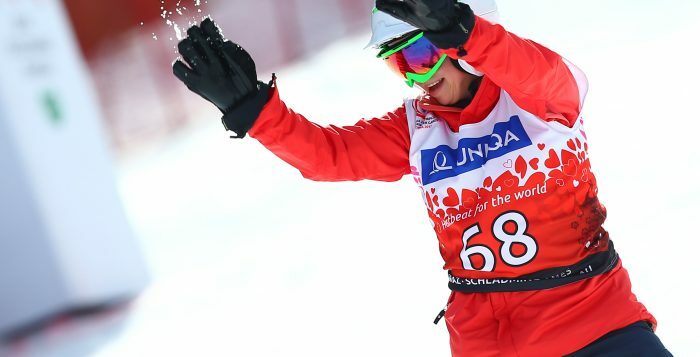 She started competing at eight-years-old and has an accomplished snowboarding career including six World Games medals and three X Games medals. The Finish Line team first met Daina at our Annual Meeting in April where she spoke in front of the entire company. 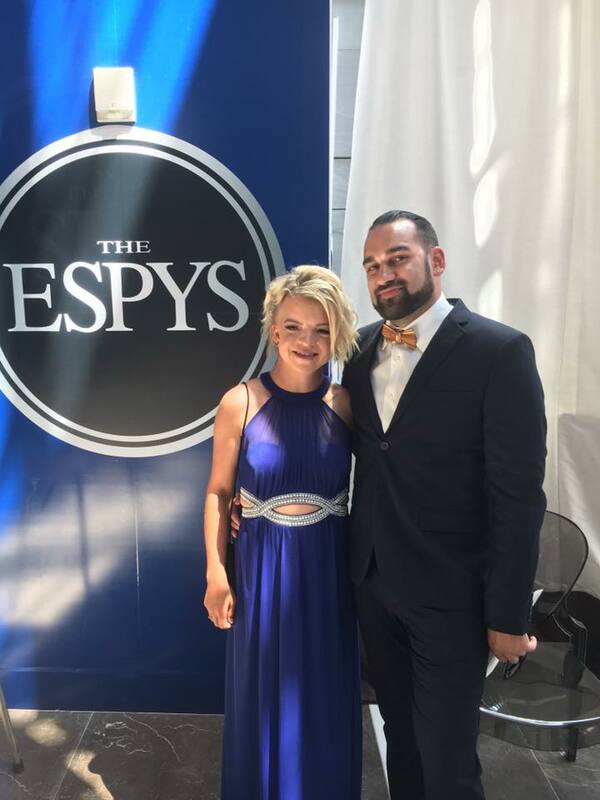 During the 2017 ESPY’s in July, Daina, alongside other athletes and Michelle Obama, presented the Arthur Ashe Courage Award to the late Eunice Kennedy Shriver. 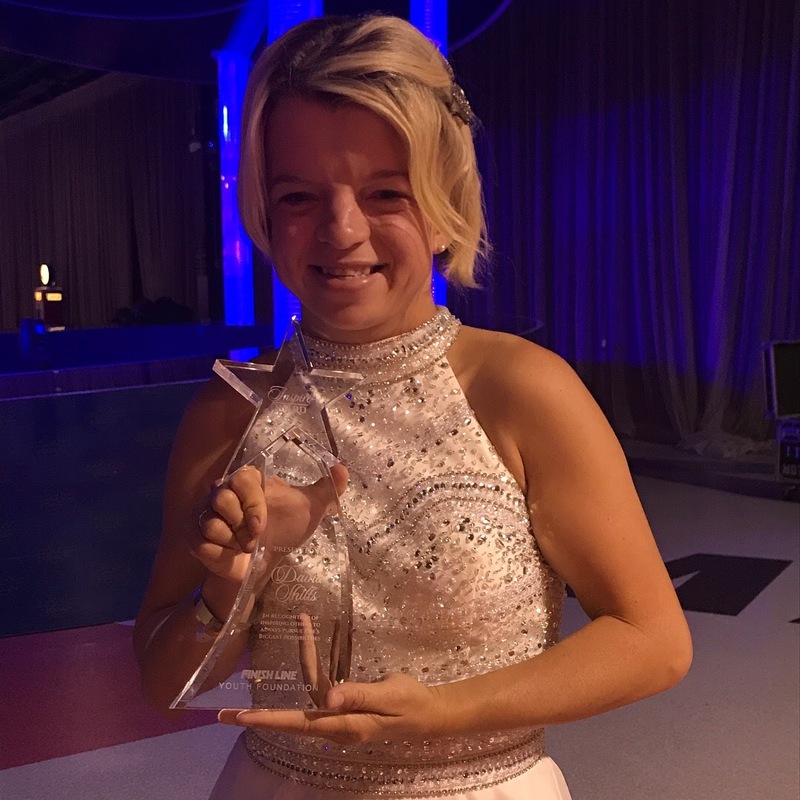 In September, she was awarded the Youth Foundation’s inaugural Inspire Award for her incredible impact inside and outside the Special Olympics movement. We are honored to welcome Daina as our spokeswoman for the 2017 in-store and online holiday drive where Finish Line will collect donations for our Special Olympics partnership. 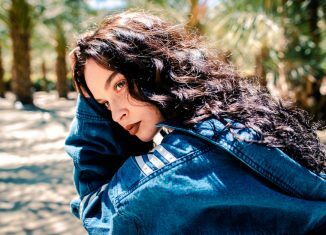 Read on and get to know her more! 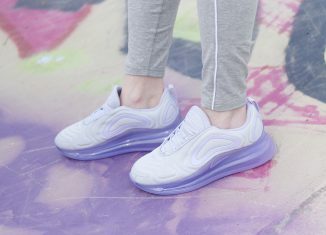 Sara: First things first, we’ve got to know, what’s your favorite sneaker? 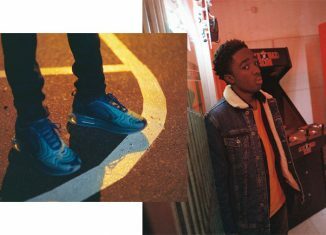 Daina: My glacier blue VaporMax Flyknits – from Finish Line of course! S: Tell us a little more about your childhood. D: I had a lot of difficulties in school. Elementary was easy, but middle and high school I got bullied a lot. Special Olympics was my escape from all the treatment at school. My parents and Special Olympics are my life line. S: What was the start of your Special Olympics career like? D: I started when I was eight-years-old with cross country skiing. After practice, I would take my skis and go up and down this hill, kind of like snowboarding. That’s how I knew I needed to switch sports and once I did, I fell in love with snowboarding. S: I know you have many, but tell us a gold medal moment you’ll never forget. D: The one that stands out the most is from the World Games in Austria earlier this year. I laid down my fastest run on the super giant slalom beating both male and female competitors. I was so nervous and shaking, but once I got in the gate, that all went away. Watch her gold medal run here! S: Why is it important for you to spread the message of Special Olympics? D: Every athlete has their story. Some have health or their family life, I have bullying. I spread the word to stop bullying and use of the R word. Special Olympics changed my life. Without it or my parents, I’m not sure I would be here today. 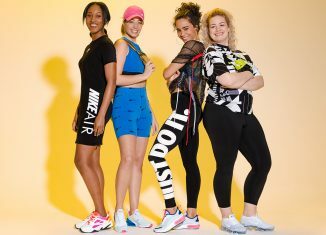 S: At Finish Line, we support a community called #WeAreMore which is all about celebrating women that lead different lifestyles, fashion choices and careers. How do you relate to this community? D: I’m much more than an athlete. At my core I’m a very enthusiastic and bubbly girl. I consider myself a great friend. I’m an aunt to more kids than I can count. I do a lot of inspirational speaking. I volunteer. I am so much more than my titles or labels. 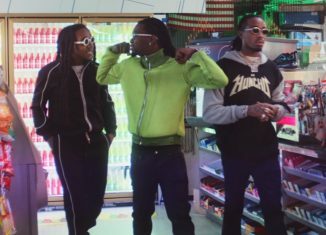 S: Speaking of #WeAreMore, we know you’re good friends with Hannah Teter. Tell us more about that relationship. D: Hannah definitely fits the #WeAreMore community. She is the only girl of all boys in her family and so headstrong. 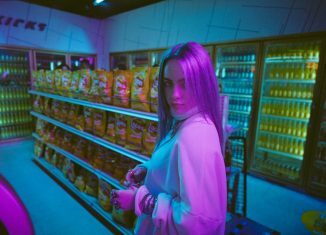 She definitely dresses the way she wants which I think is so cool! She’s a professional snowboarder, global messenger for Special Olympics and an idol of mine. We’ve been friends since 2013 and she treats me just like anyone else. 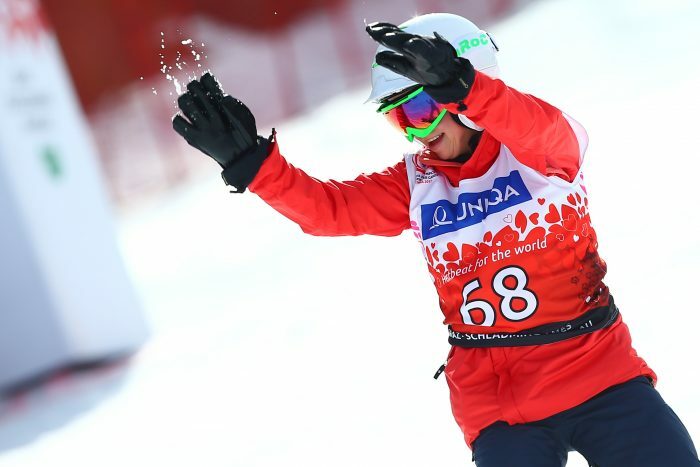 Together, we have five Unified snowboard medals. S: Why are you excited to partner with the Finish Line Youth Foundation for the holiday drive? 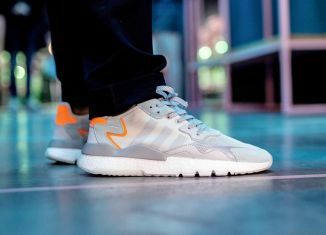 D: I am pumped because I love sneakers and athletic wear so I know the brand well and everyone who I have met from the company are amazing people. And Finish Line is the best because they support Special Olympics! Can’t wait to help spread unstoppable joy! 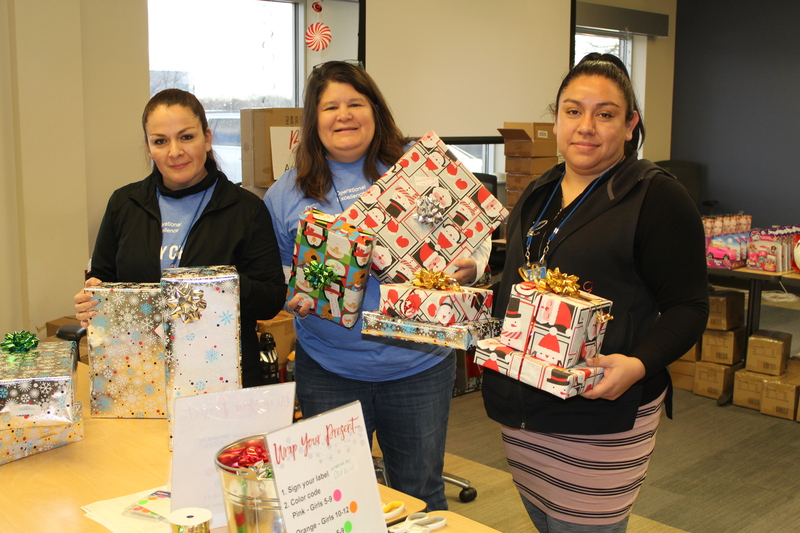 Each year, Finish Line employees come together for the annual Employee Campaign to raise funds for special projects to help those in our community. 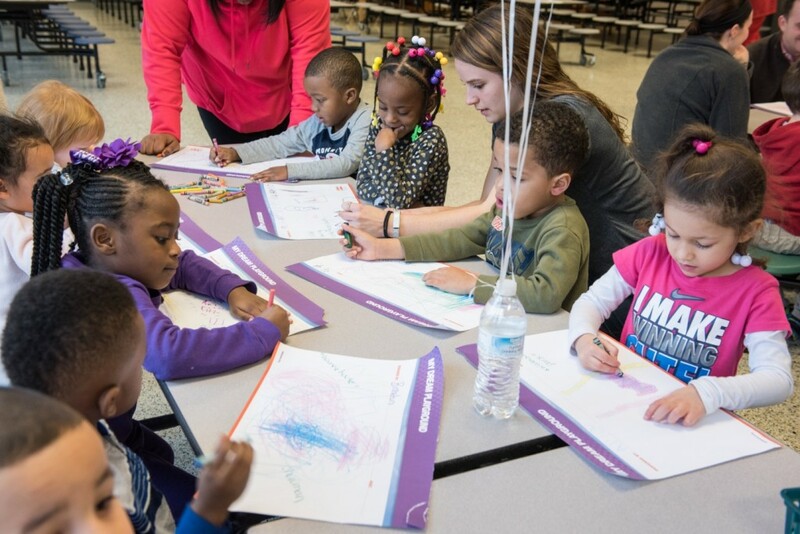 This year, the Finish Line Youth Foundation introduced our brand new multi-year initiative, Taking Pride in the Eastside, to transform our neighborhood on the Far Eastside of Indianapolis. The statistics for the Far Eastside speak volumes regarding the community’s need for this initiative. Poverty levels on the Far Eastside exceed the rest of Marion County by 100%. Twenty-three percent of Far Eastside residents are more likely to experience violent crime than other Marion County residents. Of Far Eastside residents, 38% are under the age of 18. Over the next three years, the Youth Foundation will infuse close to half a million dollars and thousands of volunteer service hours. We will do that through partnerships with Keep Indianapolis Beautiful, Central Indiana Community Foundation, the Glick Fund, Boys & Girls Club and our newest partner, KaBOOM! 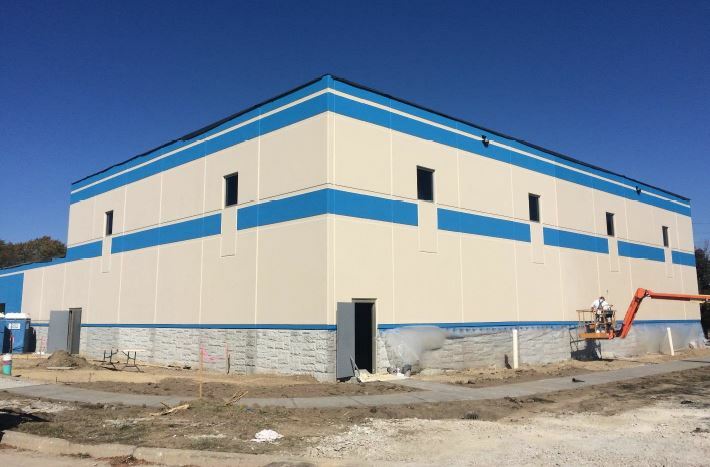 Finish Line donated $1.25 million to help jumpstart the development project for a 22,000 square foot facility named for the organization – Finish Line Boys & Girls Club. 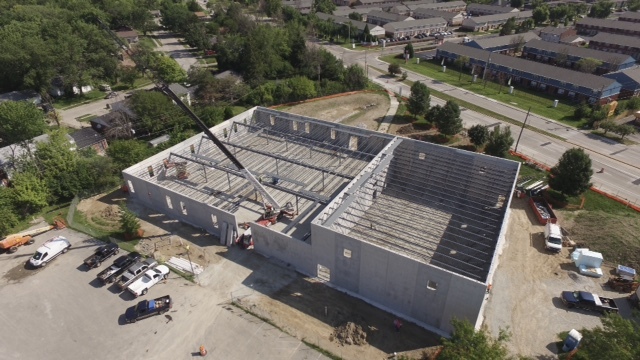 The club is scheduled to open this spring. 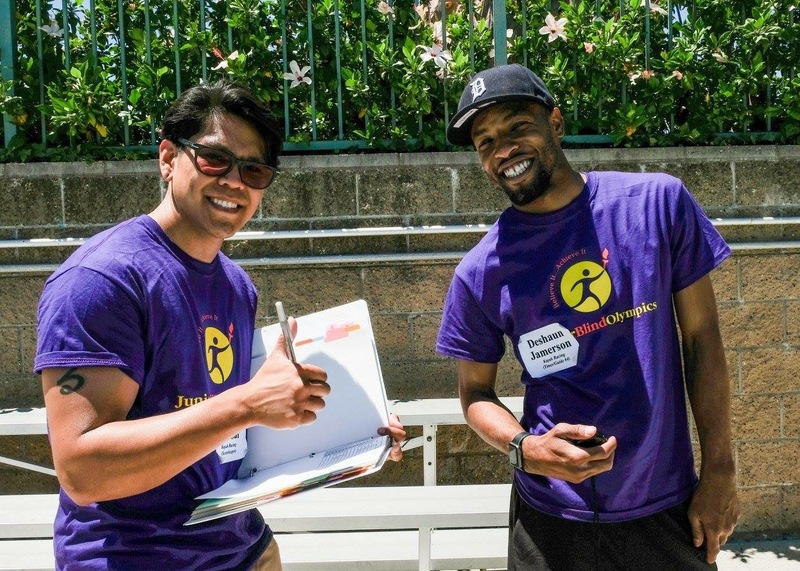 Our second project through Taking Pride in the Eastside is to build a playground with KaBOOM! Over 140 employees donated through the 2015 Employee Campaign raising a total of $85,110 to make this partnership happen. KaBOOM! is a national non-profit dedicated to bringing balanced and active play into the daily lives of all kids, particularly those growing up in poverty. KaBOOM! and Finish Line identified the Warren Early Childhood Center as our community partner and playground recipient. “I’m an ‘outside the box’ thinker, so when I saw the KaBOOM! project proposal, my mind started going 100 miles per hour! I’m looking forward to bringing the community together to show that Eastside pride is stronger than ever,” said Chris Gearlds, principal of the Warren Early Childhood Center. Last month, Finish Line and the Warren Early Childhood Center playground expert’s got together for Design Day. 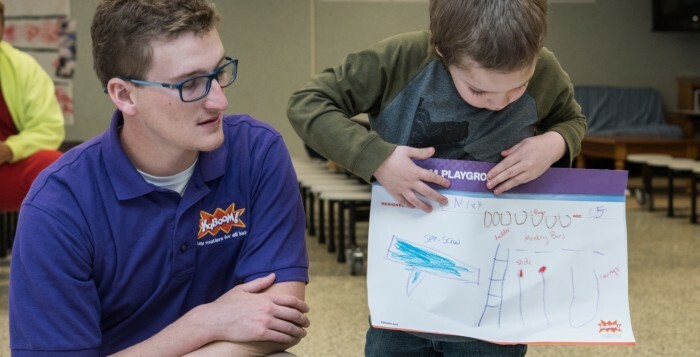 At Design Day, more than 50 kids drew their dream playgrounds. 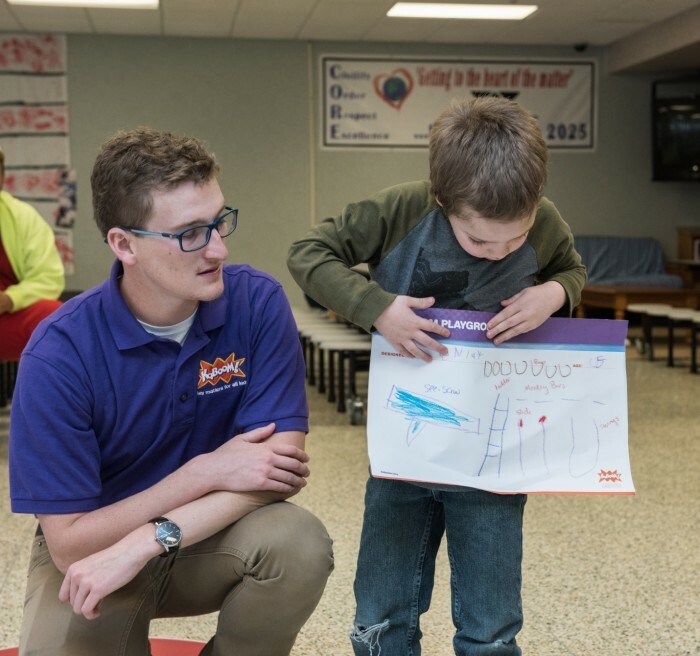 “Rather than building a private playground for their students, Warren Township and the Early Childhood Center have opted to open the playground to the public. It’s the first piece of what will become a greater community park,” said Jacob Stachler, KaBOOM! associate project manager. KaBOOM! produced three designs based off the kids drawings. Over a few weeks, the kids voted and we’ll be building the design below this spring! Visit our Facebook, Twitter or Instagram for updates on the Boys & Girls Club, KaBOOM! and other Taking Pride in the Eastside projects. 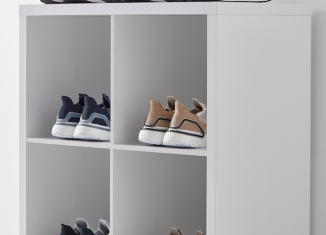 Throughout the holiday season, you may have noticed the sound of bells coming from your local Finish Line. That’s because we’re ringing them every time one of our generous customers donates to Special Olympics! 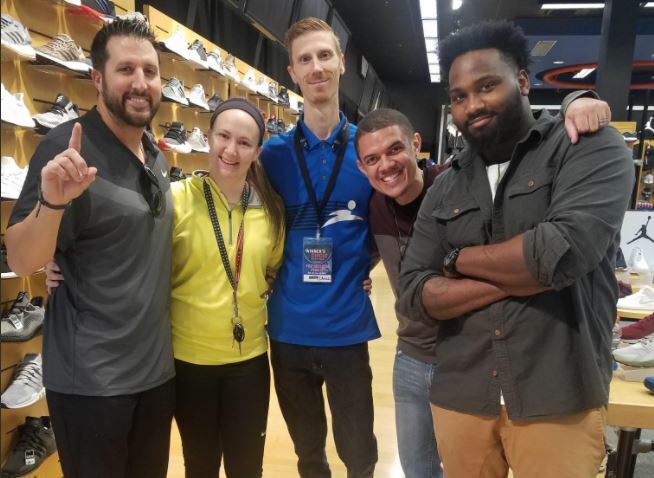 This season’s theme for the in-store and online drive is Play Unified, a global movement from Special Olympics that joins people with and without disabilities on the same team. Various Finish Line districts took part in these movements by teaming up with athletes for a little friendly competition. Between basketball, bocce and volleyball, team Finish Line got to know Special Olympics athletes by playing their sport side by side. “The day was about overcoming barriers in the special needs community. 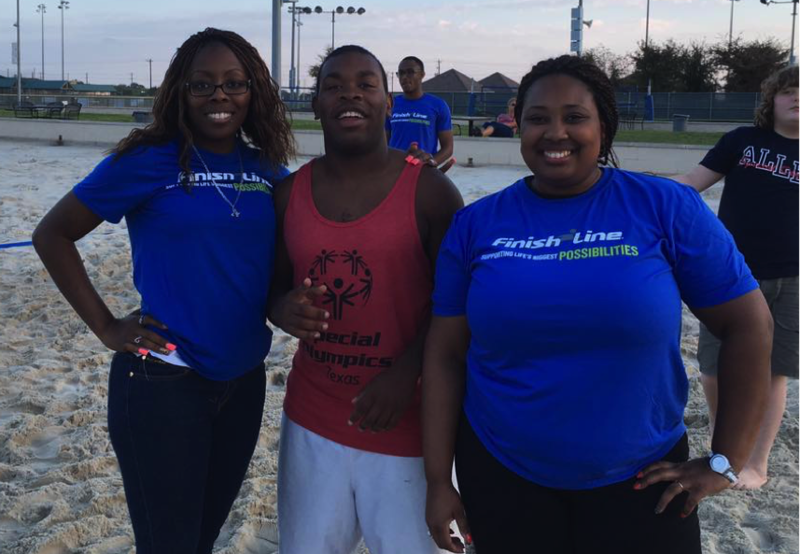 I appreciate the athletes allowing us to be a part of their games!” said Finish Line sales associate Tamica Lloyd. 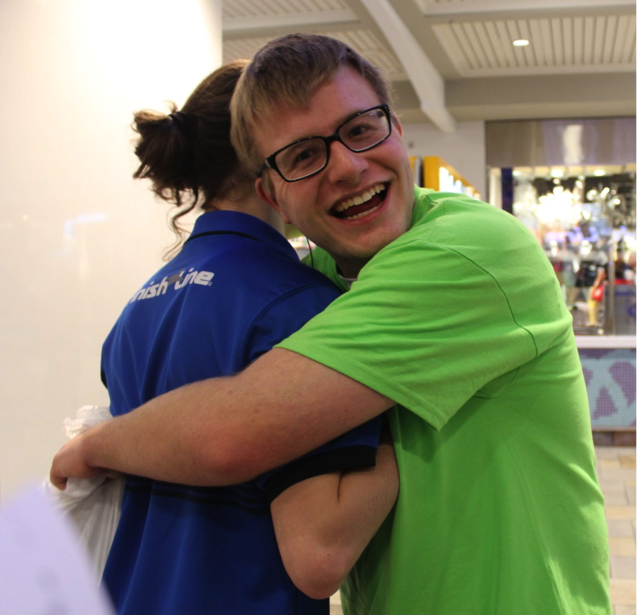 “This was my first time volunteering, but it won’t be my last. 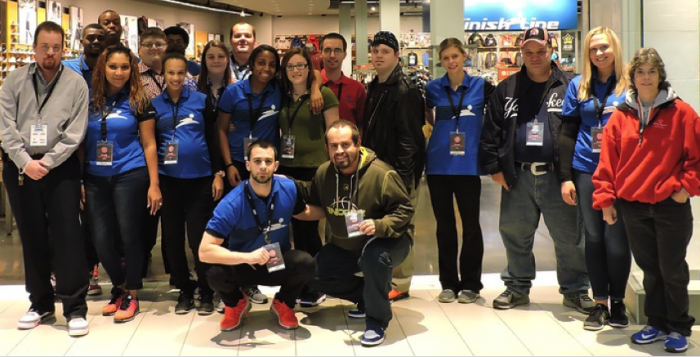 The athletes were amazing and it was one of the most fun and inspiring experiences I’ve ever had,” said Finish Line Store Manager Rosie Keomala. While Finish Line is getting to know athletes on their own turf, the athletes have stepped onto our turf for #OneSolePurpose shopping sprees. 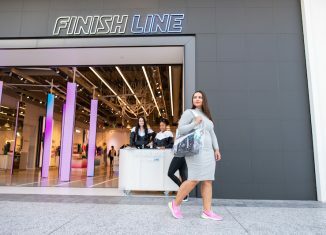 Multiple Finish Line stores nationwide have held these events to help athletes get the latest and greatest footwear and apparel. 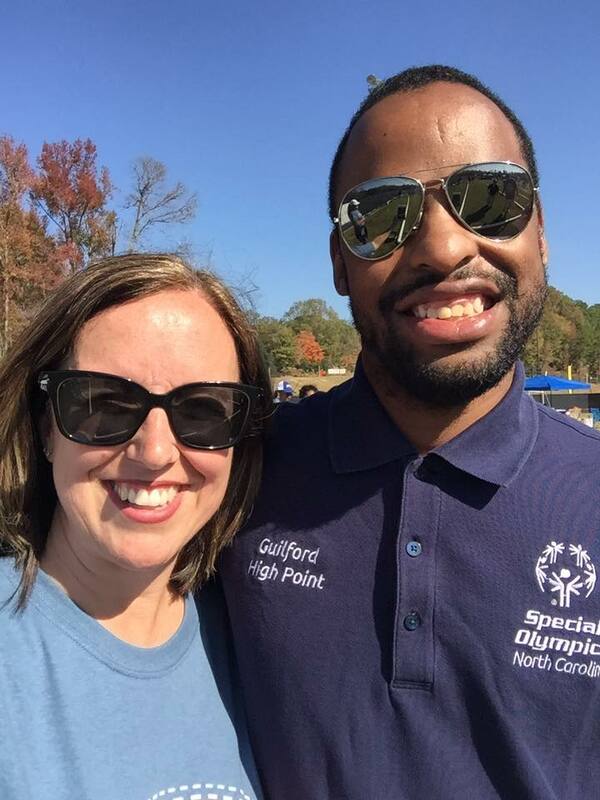 “I thought I was going to the store to help promote Special Olympics. You can imagine my surprise when I was given $100 to spend! I will get very good use out of the things I got to purchase,” said Special Olympics athlete Mitch Bonar. “I cannot say it enough for making this a day for our athletes to remember for a lifetime. They were so grateful and honored to receive their shoes. Every employee had wonderful energy and were so kind and loving to us” said Special Olympics New York Director of Development Teresa Gilli. 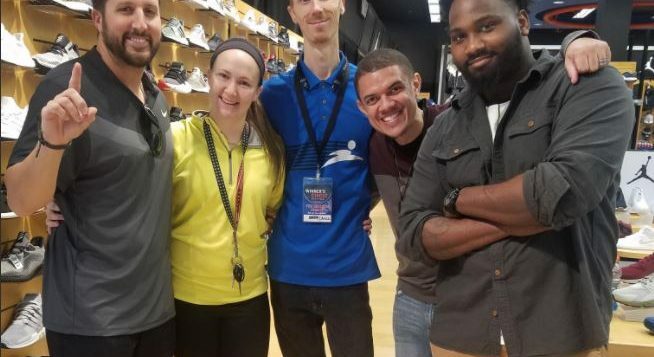 “This was my sixth year helping athletes pick out shoes and my commitment to Special Olympics only strengthens each time. I helped Kylene and was able to form a friendship out of it!” said Finish Line Assistant Manager Chelbee DellaValle-Jones. Shoe giveaways like this provide these athletes with much needed shoes and apparel to participate in various sports. If you hear the bells ringing at Finish Line this holiday season, you’ll know it’s because another generous customer has donated to Special Olympics! We’re on a mission to deliver the #EpicHoliday for Special Olympics, what are you doing to deliver the #EpicHoliday for those around you? 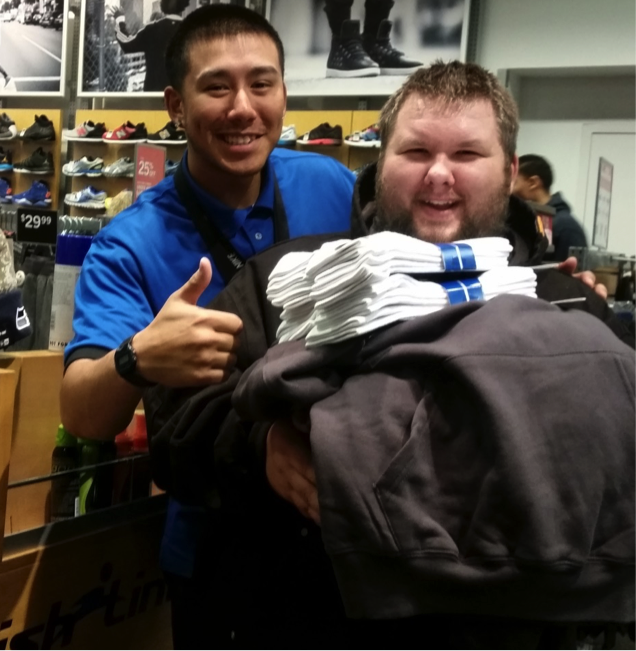 The community can help Finish Line make an impact by supporting Finish Line’s in-store and online holiday drive to support Special Olympics now through December 31.